The two-volume, 1,700-page work contains more than 2,450 entries, including biographies, geographical features, town and county histories, major events and historical movements, and much, much more about the state of Oklahoma and its people. The retail price is $100 for the set, plus $8 shipping/handling, plus applicable state and local sales taxes. OHS members receive a discount on their purchases. Institutional discounts may also apply for certain types of organizations, including libraries, schools, etc. 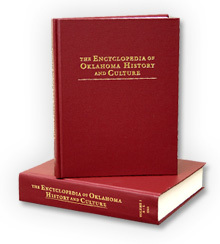 Order your copy of the encyclopedia through the online store or contact museumstore@okhistory.org or 405-522-5214.